Wanted to take a late lunch break? Bad choice: YouTube (S GOOG) became inaccessible a little after 2pm PT today, and remained inaccessible for an estimated 30 minutes, with the front page redirecting to an error page during that time. YouTube started to be accessible again around 2:50pm PT, but some people on Twitter (S TWTR) still reported difficulties accessing the site. The outage also affected playback on mobile as well as connected devices, and YouTube embeds on third parties. Tweets with embedded Twitter cards contained the same cryptic error message that’s currently being displayed on the YouTube home page. 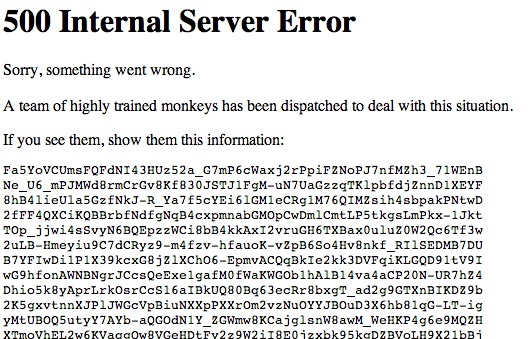 Speaking of that error message: It’s been YouTube’s default 500 error page for some time. I wanna know why it went down. An outage? Don’t they have like a gazillion datacenters?